Hyghspin twin screw pumps for the transport of fruit juice concentrates where considerably higher volumina can be fed than rotary piston pumps. 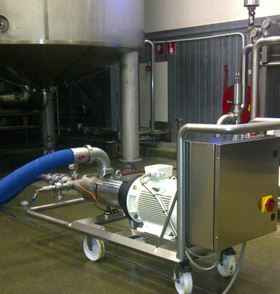 Four years after the market introduction on occasion of the drinktec in 2009 the Hyghspin twin screw pumps of Jung Process Systems established themselves on the market for hygienic food pumps. During this year’s exhibition in Munich which will take place from September 16 – 20, 2013, the company presents an overview about numerous Hyghspin installations worldwide. Interested visitors will get first hand information in hall A 5, Stand No. 301. More than 800 assembled pumps since 2009 are a clear proof that Jung Process Systems took the right measures from that time on. The pump program nowadays consists of two series, Hyghspin and Hyghspin DF, for transport capacities between 30 l/h and 200 m3/h as well as feed pressures up to 50 bar.